Don’t fret folks. Nothing to worry about, at least for now. 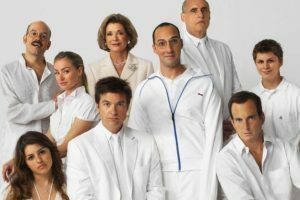 ‘Arrested Development‘ as currently paused production to allow series creator Mitch Hurwitz to review footage that has already been filmed and add new scenes. You see, Netflix is so excited about having this tv series, that they have just ordered more episodes for the 4th season. Originally, Netflix ordered 10 new episodes for the hit series, but now Netflix wants between 12 and 15 new episodes, depending on the new story arcs that Hurwitz is working on according to Deadline. Production is expected to begin again in late January with the actors returning to shoot new scenes. This won’t delay the release of the season, which is in April where Netflix will release all of the episodes at once for viewing. This is great news. Any new ‘Arrested Development‘ is good ‘Arrested Development‘. This entry was posted on Wednesday, December 12th, 2012 at 12:05 am	and is filed under News, Television. You can follow any responses to this entry through the RSS 2.0 feed. You can skip to the end and leave a response. Pinging is currently not allowed. « It’s a Bird. It’s a Plane. It’s the new Superman Trailer!!! Yeah, yeah. I would've asked for your number. And I wouldn't have been able to wait 24 hours before calling you up and saying, Hey, how about... oh, how about some coffee, or drinks, or dinner, or a movie... for as long as we both shall live?